What a wonderful showcase for your fashion doll! 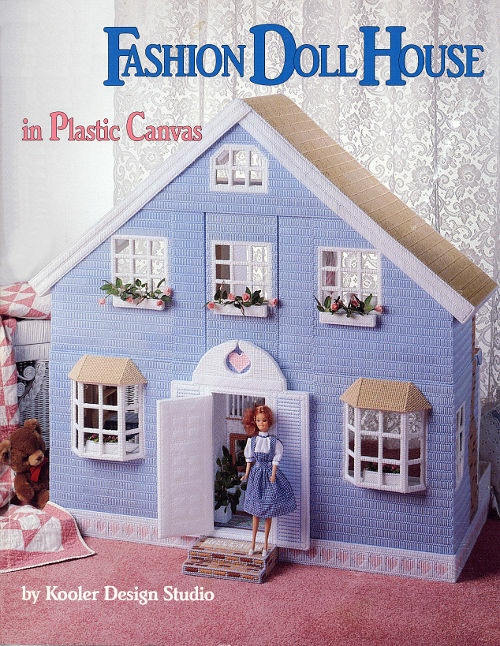 Create this sturdy dollhouse entirely of plastic canvas, worsted weight yarn and some trims. Stitch and assemble the house as eight separate modular units that fit together with architectural precision and stability. From the fireplace in the Living Room to the Attic with it's trunk that really opens, this house is full of features that even brick & mortar homeowners would envy. The kitchen boasts a trash compactor that opens. 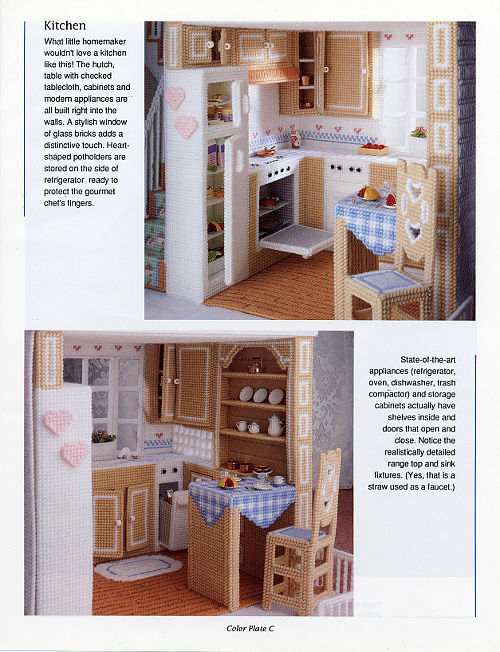 The many cupboards and bookcases have shelves that are functional. A toilet in the bath has a seat and lid that actually lift. 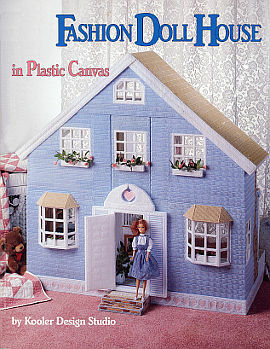 Although the Dollhouse is entirely made of flexible plastic canvas, it is very stable. There is a unique support grid made entirely of canvas for the foundation, the ceilings of the Living Room and the Kitchen, the Attic floor and the Roof. Most of the furniture in the rooms is connected to the floors and ceilings; this provides added support. The support grids and the furniture construction ensures a Dollhouse that will not sag or distort in shape even after many hours of play. 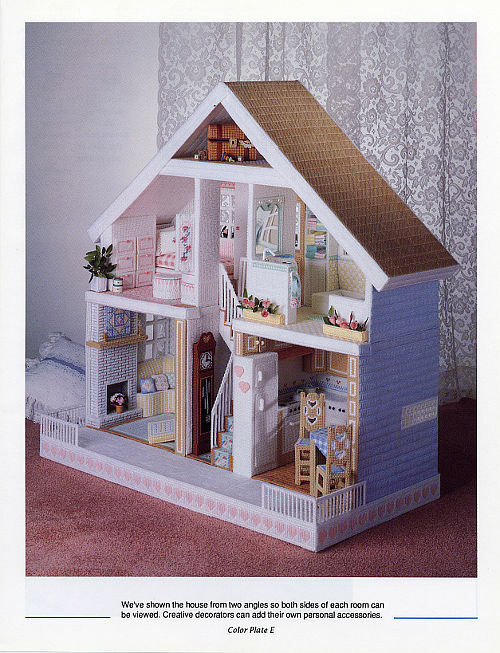 The overall finished size of this beautiful dollhouse is about 38" tall, 40" wide and 18" deep. 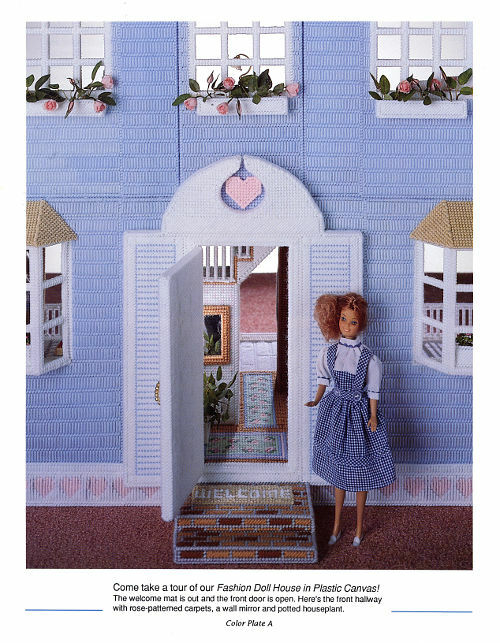 It will easily accommodate an 11" fashion doll and her lifestyle. PLEASE NOTE: This download is very, very large (250 Mb), and is recommended ONLY for customers who have very fast and reliable internet connections. For most people we advise ordering the DVD. Due to the size of the file, the link in your invoice will not be the file itself, and we will send you a personalized link once your order is completed in a separate e-mail.